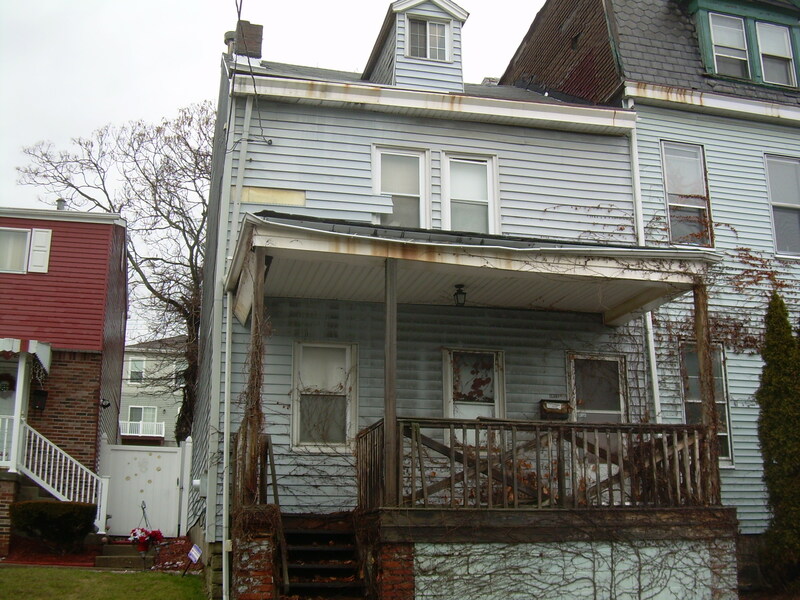 Garfield – While many would say that conditions in the neighborhood have improved dramatically in recent years, Garfield remains saddled with a large inventory of vacant, seemingly abandoned houses. 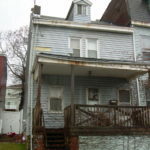 According to Rick Swartz, the Bloomfield-Garfield Corporation’s (BGC) executive director, his organization’s staff recently conducted a survey of most of the neighborhood’s streets, and it revealed at least 131 empty houses, many of them in deplorable condition. 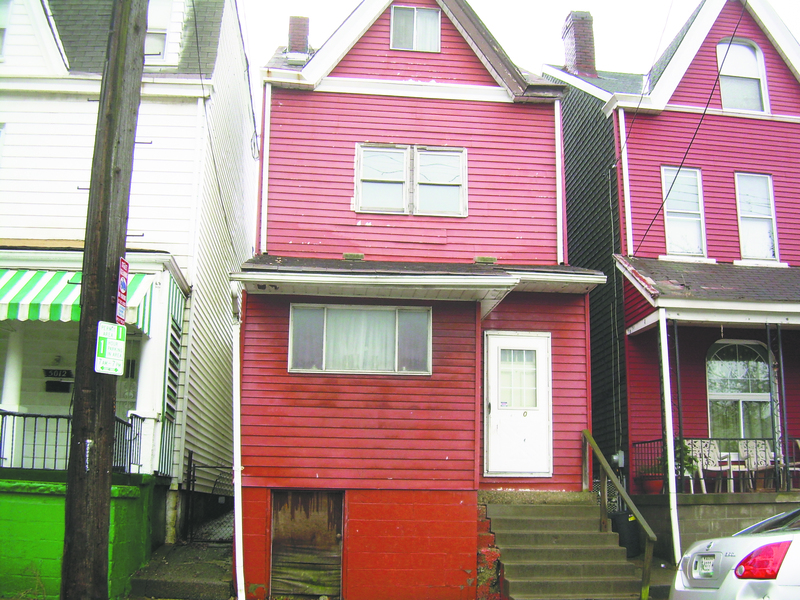 Swartz pointed to four houses, all within two blocks of Penn Ave., that illustrate the plight the neighborhood faces when trying to eliminate the blight and potential danger such properties pose to neighbors. A single-family home at 5010 Dearborn St., owned by David and Marcia Grenick, is on the BGC’s list. Public records show reveal that the Grenicks use an address in McKees Rocks for receipt of their county tax bills, but evidently stopped paying years ago. He went on to say that, even if a private party were to pay $30,000 or $40,000 in the end to secure clear title, the house at 5010 Dearborn may need anywhere from $75,000 to $150,000 to make it a desirable place to live once again. 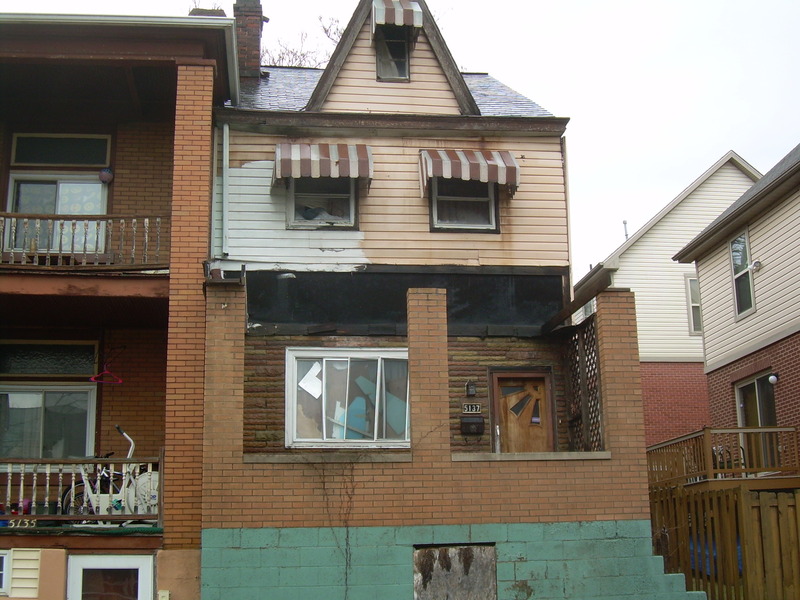 The city has tried to contain the spread of blight in neighborhoods like Garfield by coming after tax-delinquent owners of vacant properties, he explained. The Urban Redevelopment Authority offers to “tag” such properties, if the community group so desires. When they are tagged by the URA, the city must then decide if a public sale is warranted. If it agrees, then the property goes to what is known as “Treasurer’s Sale,” an auction held in City Council chambers once or twice per year; the next one is set for August. However, as Swartz cautioned, this may not be the solution to eliminating blight. 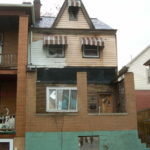 Ultimately, unless there are private investors who are willing to spend the necessary money on renovations, and then attempt to sell them for $250,000 or more, he said, what may happen is that all three homes will have to face the wrecking ball. Demolishing the structures would result in vacant lots. Even if a neighboring owner wanted to buy the property from the city, they might have to wait a year or longer to finalize the sale; “not exactly an encouraging prospect,” he added. Although Mayor Bill Peduto promised late last year that a “land bank” would be operational by early spring of 2018, the city’s efforts to start the land bank have been stalled for almost four years. Proponents see the land bank as a mechanism to move vacant, abandoned properties that the city has already acquired in a much more expeditious fashion than the otherwise lengthy disposition process. Swartz said the “jury is still out” on whether the land bank will fulfill those hopes, but acknowledged that a more effective land banking process could spell the difference between salvaging abandoned & foreclosed properties, and losing them forever. He relayed that it is up to the BGC’s housing and land use committee, which is open to anyone who wants to help attack problems like these, to determine whether or not to try and acquire eight to ten of the most salvageable houses. 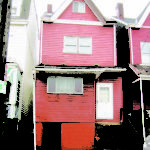 To obtain a copy of the BGC’s list of vacant houses, contact Tyler Wheeler at Tyler@bloomfield-garfield.org. To join the housing and land use committee, contact Nina Gibbs at Nina@bloomfield-garfield.org. The Allegheny Lead Safe Homes Program seeks to identify and control lead-based paint hazards in approximately 175 eligible units throughout Allegheny County, including the City of Pittsburgh. 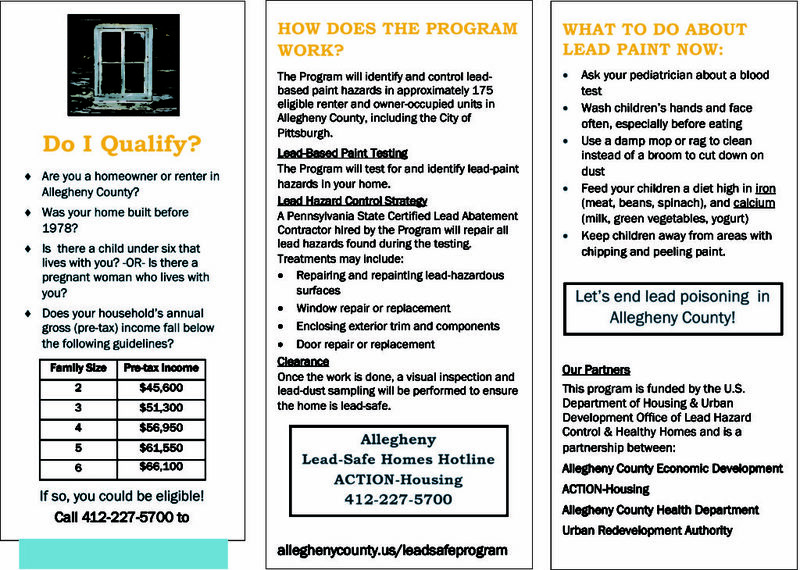 To find out whether your dwelling is eligible for free lead paint remediation, visit the program’s website. NeighborWorks Western Pa. and PNC Bank will co-host a FREE presentation for potential home buyers on Saturday, October 13, from 8:30 a.m. to 4 p.m. Learn how to take the right steps to homeownership! Location: Children’s Home of Pittsburgh, 5324 Penn Avenue, Pittsburgh, PA 15224. Lunch will be provided. To register, call 412-281-9773 or 412-281-1100 x100. Garfield rated an editorial in the Pittsburgh Post-Gazette this morning. It starts off with a slightly dated view of the neighborhood, but then gives credit where credit is due for community development. 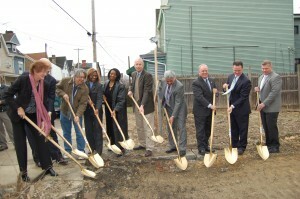 After much anticipation, Garfield Glen had its official groundbreaking ceremony this morning. 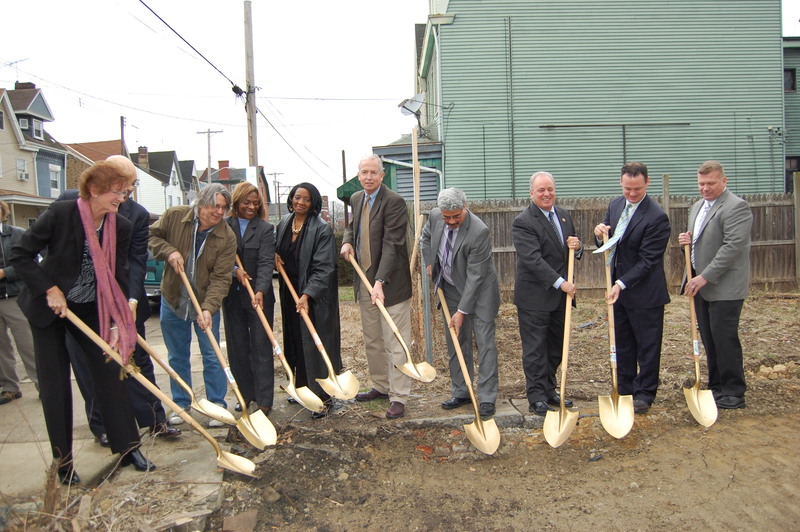 Partners in the project and public officials including Mayor Luke Ravenstahl, Councilman Ricky Burgess, and U.S. Rep. Mike Doyle grabbed shovels to symbolically break the ground at one Garfield Glen site on Dearborn Street. Garfield Glen, an affordable rental development, is a joint initiative of the Bloomfield-Garfield Corporation and S&A homes. It will consist of 45 rental units, which will be a mix of two-, three- and four-bedroom Energy Star-rated homes. The units will be located on sites throughout Garfield between N. Mathilda and N. Atlantic. Garfield Glen will be open for rent to households earning less than $35,000 for a family of five, $32,000 for a family of four, $29,000 for a family of three or $26,000 for a two-person household. The community is invited to a groundbreaking for Garfield Glen, an affordable rental housing development on scattered sites in Garfield. 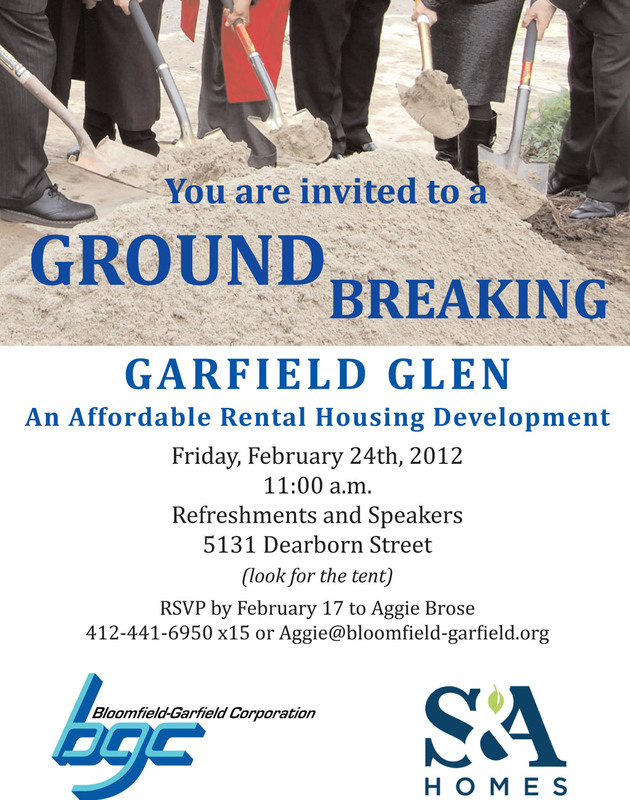 Join us for refreshments and speeches at 11 a.m. on Friday, February 24, at 5131 Dearborn Street (Look for the tent!). RSVP by February 17 to Aggie@bloomfield-garfield.org.